Ask what your puppy is eating before he comes home, and keep him on that for a week or so before you change it. The most important thing to remember with feeding puppies is that their digestive systems are still developing – so they are prone to upset tummies. 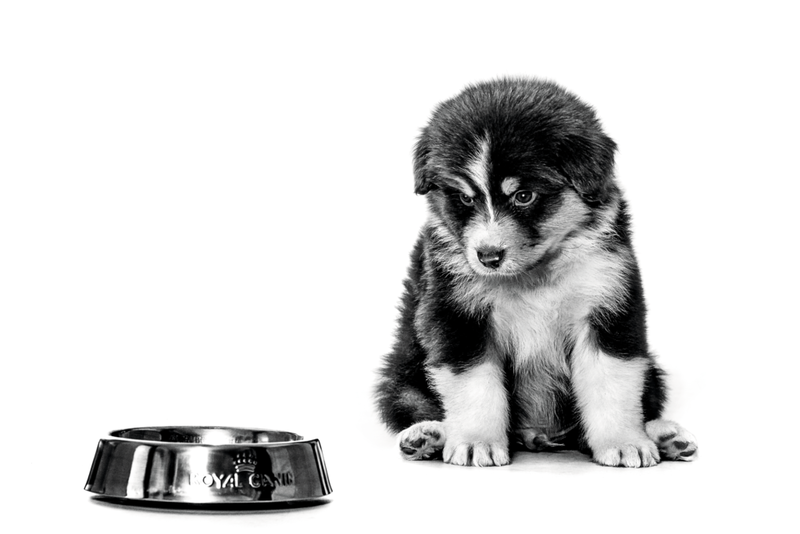 Try an ultra-digestible food designed for puppies and feed little and often. Divide the daily amount of food (the pack will tell you how much you should feed per day) into 3 or 4 portions, and feed him his meals at regular intervals, so that his tummy doesn’t get overloaded. At 6 months, you can get him down to 2 or 3 meals per day. Supervised feeding of your puppy is always recommended. There are many different types of pet food, but choosing the right one for your puppy is what really matters. What constitutes the right food for your puppy varies according to his neuter status, how old he is, what size he is, what breed he is and any special considerations that your vet might identify (sensitive tummy or skin, for example). The basis of good nutrition is providing everything the body needs to function properly and maintain itself in good health, which is particularly important for growing puppies. Confused about what food is right for your puppy? Try our online food selector. The average ‘supermarket’ puppy food will contain about 30 ingredients, while a tailor-made nutritional food available from your local pet specialist will contain around 50 carefully selected nutrients, put together in a kind of jigsaw puzzle to provide exactly the right combination of ultra-digestible proteins, carbohydrates, fats, and added vitamin and mineral complexes to safeguard your puppy’s current and future health. The other decision to make is between dry and wet food. Dry food should be completely nutritionally balanced (so you only need to serve fresh water alongside) and it also has proven dental benefits.